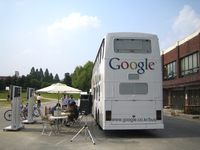 'We are basically running a small municipal transit agency', said Marty Lev, Google’s director of security and safety, who oversees the program." Talk about privatization. Hard for a munipal transit authority to compete something like this, especially in a place where public transportation is an afterthought.